by Adam -- Ok all of you who have driven a three cylinder car manufactured prior to 1991 raise your hand. Anyone? Now the engine seems to be making a comeback for fuel economy reasons, but historically three cylinder cars are not the norm. Sure, there are some very cool and interesting cars with three cylinders, but for the life of me all the examples I can think of are two strokes. DKW, NSU, and Auto Union along with the Saab Sonett and 93/96 all are excellent examples of cars that totally rocked the three pot and some in race trim. If Erik Carlsson won the Monte Carlo rally in one, isn’t an engine with three cylinders good enough for you? To stand out from the crowd, run half a six cylinder with a turbo as an added bonus. Dressed in a blue paint job and appearing to have all parts in place with additional modifications you could have some fun and still get 40mpg. 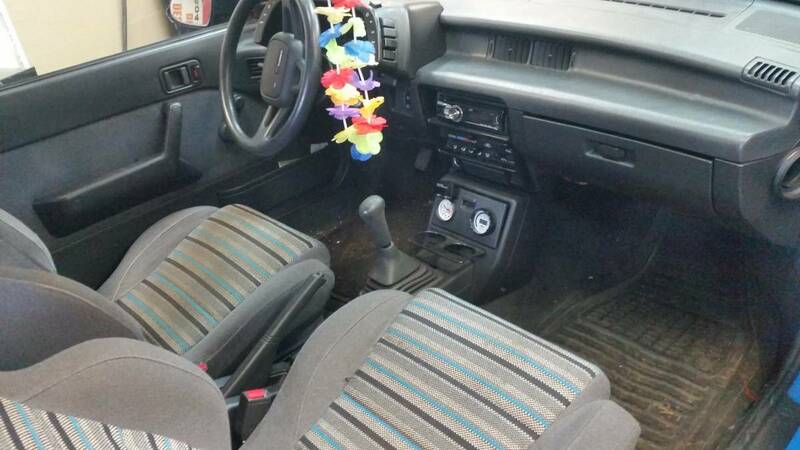 Find this 1991 Chevrolet Sprint Turbo on Craigslist for $4,900.00 in Vancouver (Maple Ridge), British Columbia. Having very few fuel efficient appealing cars in the early 80’s Chevy decided if they couldn’t beat ‘em then partner up with ‘em. After purchasing a 5.3% stake in Suzuki it rebadged the Swift and got to selling the car. The Turbo Sprint was only offered in the US in 1987 and 1988, and added fuel injection, turbo and intercooler to the normally carbureted Sprint The turbo version was of course for the discerning buyer. But what’s that you say this is a 1991. But of course this is a custom built Chevy Sprint or Kasutaumu Tabo in Japanese. In stock form weighing in at around 1600 pounds and putting out over 70 horsepower from the 993cc engine means the power-to-weight ratio is in the enthusiast’s sweet spot. 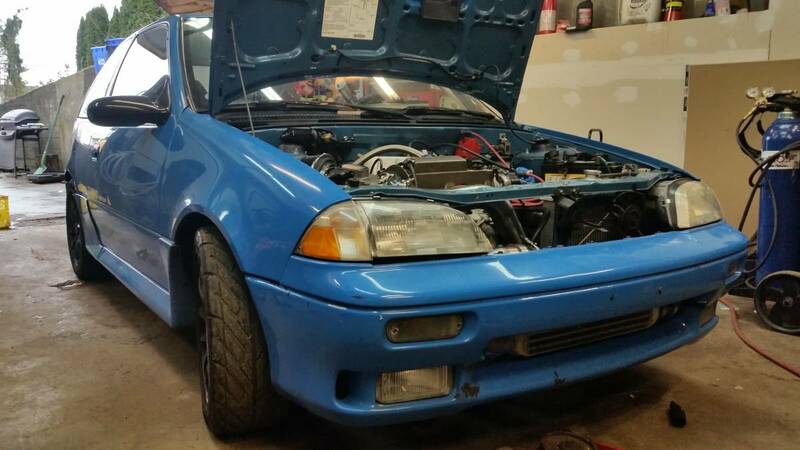 This engine is bored, has a Garrett turbo, custom built exhaust manifold, and the seller claims 165hp at the wheels. Ever see torque steer give you whiplash? Buy this one and you will have a shot at experiencing the phenomena. A rebuilt engine now runs 17 pounds of boost down from the 19 pounds which I am guessing is probably one of the reasons for the rebuild. Reported quarter mile times are around 16.1 seconds for a stock model so count on this Sprint being the Usain Bolt of Chevy Sprints. Not bad for a small car with a neat body kit and aero wheels. From the front the car presents like a good looking driver, but with the tastefully executed modifications. Unlike owners asking for crazy money and then posting two hazy photographs which appear to show either a Yeti or the Loch Ness Monster the engine shot and body shots are refreshing. Appearing clean and detailed the fuel injected engine is tune able using an AME piggyback ECU and a lap top. The turbo, multi-port electronic fuel injection and electronic spark control on the stock model help to almost double the torque from the base model and this tuned version will have even more. 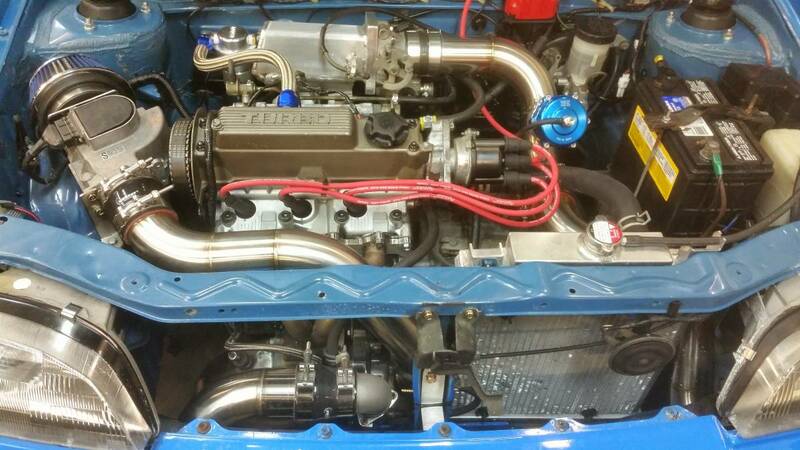 The seller may even have some dyno sheets after seeing how well this build presents and it would never hurt to ask. Who doesn’t need more torques? During college in the 90’s I agreed to pick up a dorm mate to be able to drive a stock 1988 turbo version of this car to the airport to pick him up after arriving back in town. The twisty roads were enjoyed while the car war empty, but even after the car was loaded I remember the car being fun without as much body roll as most 80’s cars The seats look in good shape and the remainder of the interior in good condition. See a better three cylinder hot hatch? Sprint down to the comments and let us know about it. Some day I'll have one! NSU never made either 3-pots nor 2-cycle engines...the only odd "cylinder" number car they made was the original Wankel Spyder that had the single-rotor KKM engine. All of their microcars (Prinz series) were 2 cylinder 4-cycles.